It has been over 70 years since Dr. Yoshio Nishina constructed the first small cyclotron in Japan at RIKEN. Currently, the Nishina Center accelerates uranium ions using a superconducting ring cyclotron (the 9th cyclotron at RIKEN), contributing to the discovery of new isotopes from nuclear fission. The unbroken line of tradition of the Nishina Center is described in the following. Yoshio Nishina is the father of nuclear physics in Japan. He was born on December 6, 1890 in Okayama prefecture as the fourth son of Arimasa (father) and Tsune (mother) Nishina. 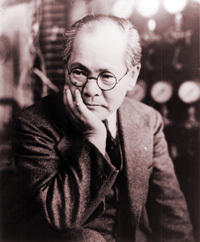 In 1937, Dr. Nishina constructed the first cyclotron in Japan (the second in the world) at RIKEN and established the foundation of nuclear and elementary particle physics research. He also led pioneering research activities to apply radioisotopes to a wide variety of research fields, including medicine and biology. He was granted the Bunka Kunsho (Order of Culture) by the Japanese government in 1946. The Nishina laboratory at RIKEN attracted many researchers, including Sin-itiro Tomonaga and Hideki Yukawa, who then accomplished many remarkable achievements. Research on atoms and nuclei was initiated by the discovery of X-rays by Wilhelm C. Röntgen in 1895 and subsequent accidental discovery of different kinds of radiation (later identified as alpha, beta, and gamma rays) emitted from uranium ore that have strong penetrating power by Antoine H. Becquerel in 1986, who was inspired by the discovery of X-rays. These two major discoveries opened the endless exploration of the microscopic world. Establishing the knowledge of atoms and nuclei such as “all the materials that we encounter in daily life consist of about 90 kinds of elements (atoms) that have a structure where electrons encircle a nucleus” and “a nucleus that has a structure where several protons and neutrons form a mass with a size of < 10–14 m and move around within such an ultramicroscopic space” (see Figure below), which is now common sense, in fact required major intellectual struggle by a number of geniuses. Hantaro Nagaoka was one of such genius, who proposed the Nagaoka model of the atom (predicting the existence of the nuclei) in 1903. At the same time, these two major discoveries triggered applied research of X-rays and radiation, which are radiographs and radioisotopes (RIs), respectively. Interestingly, both were first applied to medicine. The atomic world is governed by quantum electrodynamics established by physicists including Sin-itiro Tomonaga and the nucleic world is ruled by the nuclear force described by Yukawa theory. Both Drs. 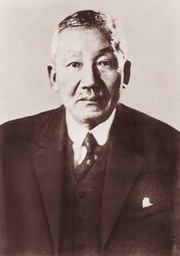 Yukawa and Tomonaga were researchers at the Nishina Laboratory. X-rays are emitted when atoms are excited, while alpha, beta, and gamma rays are emitted when nuclei are excited by some stimulus. Ernest Rutherford demonstrated the existence of the nucleus of the gold atom in 1911 by irradiating gold foil with alpha rays emitted from the RI of polonium discovered by Marie Curie. However, the intensity of radiation obtained from natural RIs is too weak to precisely examine nuclei or produce a large amount of RIs. Hence Rutherford intensively appealed for the construction of an accelerator that could accelerate nuclei up to an energy (speed) at which target nuclei can blasted apart. In the 1930s, the invention of various types of accelerators marked the climax of the response to Rutherford’s appeal. They included a cyclotron (Ernest Lawrence), which is the basis of the current accelerators, an electro-static charged particle accelerator (John Cockcroft and Ernest Walton), and a LINAC or linear accelerator (David Sloan). A cyclotron can generate powerful proton or deuteron beams, enabling the production of artificial RIs that have strong radioactivity. In 1937, Yoshio Nishina of RIKEN constructed the first cyclotron in Japan (the second in the world), initiating pioneering research on nuclear physics, nuclear chemistry, and radiobiology. 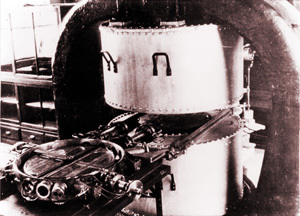 Two types of RIs, 24Na and 32P, produced by this cyclotron were used in the research on the metabolism of living organisms for the first time. Since the construction of the first cyclotron, RIKEN has constructed six cyclotrons. Construction of cyclotron has in fact become its specialty. Currently, ring cyclotron (RRC cyclotron, the 5th cyclotron), AVF cyclotron (the 6th), fRC cyclotron (the 7th), IRC cylcotron (the 8th), and SRC cyclotron (the 9th) are operating at the Nishina Center. 3)	Even if the numbers of protons and neutrons in a nucleus are very different, the volume occupied by one proton and that by one neutron are nearly identical and the total volume of a nucleus is approximately proportional to the sum of the number of protons and neutrons (Robert Hofstadter). All of the scientists won Nobel Prizes for these achievements. It should be noted that the standard model of nuclei was established based on data obtained using naturally occurring, stable nuclei and accelerator-produced RIs. In the mid 1980s, a remarkable breakthrough in nuclear physics was achieved. Isao Tanihata and colleagues invented RI beam generation technology and discovered halo nuclei. They accelerated 20Ne ions up to 90% of the speed of light using a heavy ion accelerator, called "Bevatron/BEVALAC" at the Lawrence Berkeley National Laboratory in the United States, and smashed them into targets. They then measured the radius of lithium ions produced in the collision, revealing that the measured radius drastically increased for the 11Li ions, which was later called a “halo structure” of neutron. This structure cannot be explained by the standard model of nuclei, prompting the exploration of the nuclear realm using RI beams all over the world. 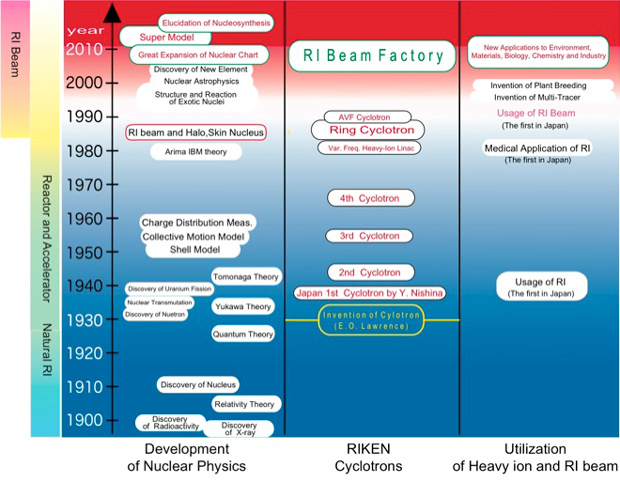 At RIKEN, nuclear physics research using RI beams has gained full momentum since 1990, and its research achievements have been leading the world to a large extent. We have completed the construction of the RIBF at the RIKEN Nishina Center, which is one of the world leaders in accelerator science.